Lord Viṣṇu’s vehicle is Garuda which means ‘Wings-of-speech,’ in the Vedas he is also known as Garutman. He represents the Vedas which carry the Lord of Sacrifices. According to the Purāṇas, Garuda is the son of Kaśyapa (vision) and Vinatā (She-before- whom-knowledge-bows). Vinatā quarrelled with her co-wife Kadru (chalice-of-immortality) who was the mother of the ever-moving ones — the serpents which are the symbols of the cycles of time. (They also symbolise anger and hostility which are the strongest factors which obstruct the spiritual journey.) From this quarrel originated the enmity between Garuda and the serpents and his quest for the nectar of immortality — the jar of which he holds in his right upper hand. Garuda's wife is Unnati (progress) also called Vināyakā (queen-of-knowledge). He has six sons; Sumukha (Beautiful-face), Sunāma (Beautiful-name), Sunetra (Beautiful eyes), Suvarcas (Beautiful vigour), Suruk (Beautiful brightness) and Subala (Beautiful strength). In order to expound the great spiritual truths contained in the Vedas, the greatest of spiritual masters Veda Vyāsa mahā-muni composed the Itihāsas and Purāṇas. Our first intimation or concept of Spirituality is through the medium of the scriptures. The existence of a God can be inferred by logic but through the senses and mind it is impossible to know anything about the Godhead. 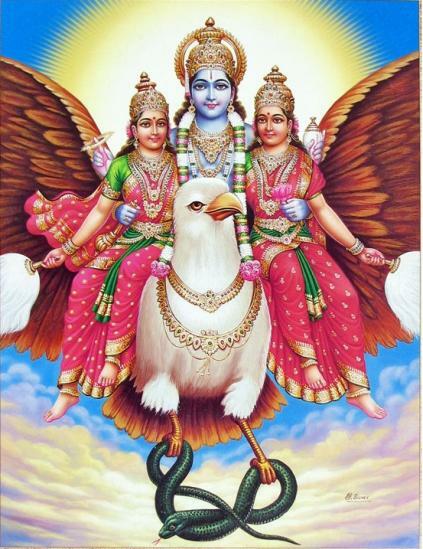 It is through Śastra alone that we can know the Lord; therefore Śastra is the vehicle of Divinity and as such the Śastra are depicted in iconography as Garuda. When the Lord is identified as Sūrya Nārāyaṇa, then Garuda becomes the stratosphere which conveys and modifies the rays of the sun to the earth and thus prevents the destruction of life by the intensity of the heat. The chief of the attendants of the Lord is Viśvaksena (The-all-conqueror). He is said to represent the Āgamas which are the scriptures which deal with the ceremonial worship of the lord and all matters pertaining to temples, festivals, icons etc. The True Scriptures consist of the Vedas (Nigamas) and the Tantras (Āgamas). Whereas Garuḍa represents the elitist Vedas, Viśvaksena is the populist Tantras. He is sometimes shown as a “Vaiṣṇava Gaṇeśa” and sometimes in a human form similar to Viṣṇu but displaying the Tarjani mudra. The eight door-keepers of Vaikuṇṭha are known as Dhāta & Vidhātā (East), Bhadra & Subhadra (South); Nanda, Sunanda (North); Jaya & Vijaya (West). Sometimes Nanda and Sunanda are replaced by Caṇḍa and Pracaṇḍa. 1. ātma siddhi— power to be completely unattached and unaffected by material nature. 2. vividha siddhi— power to control matter, and minds of others. 3. jñāna siddhi— ability to remember past incarnations of oneself and of others, and the power to see the future. 4. tapas siddhi— perfect control over heat and cold, hunger and thirst, etc. 5. kṣetra siddhi— ability to astral travel anywhere in the universe. 6. deva siddhi— control over devas, demons, elementals, nature spirits and others. 7. śarīra siddhi— attainment of physical perfection, to delay the aging process, have perfect health and to heal others. 8. vikriya siddhi— power to accomplish all desires, to change ones appearance into any desired form. These siddhis are the outcome of intense yogic practice, but they are undesirable as they can possibly be the cause of one's downfall from the spiritual path through distraction of the mind from the Ultimate Reality. Sooner or later every serious yoga practitioner is accosted by one of these gate-keepers, but one should not heed them. The power (śakti) of Vishnu is represented as the power of multiplicity, or the Goddess of Fortune called Lakṣmī (”she-of- the-hundred-thousands”), she is also known as Śrī (“the- beautiful-one”). As the consort of Vishnu she appears with Him in every one of His incarnations. She is the Immaculate mediatrix of all Grace and is the embodiment of Compassion and Forgiveness on an absolute level. She is the preserving energy, and on the material plane this takes the form of resources and wealth. Without wealth there can be no undertaking of religious activities like yajñas, or any charity. Sickness, decay, disease all follow after poverty. Lakṣmī is therefore the power or śakti inherent in wealth. Lakṣmī is known as cañcala (the-fickle-one) and does not remain long in one place, but in iconography she is depicted as always rendering service by massaging the feet of the Lord, she is totally under His control and He uses her for the welfare of all beings. In sattva guṇa; she accompanies Mahā Viṣṇu upon Garuda. In rajo guṇa: rides alone upon an elephant or sits upon a lotus. In Tamo guṇa: rides alone upon the owl Ūluka. The owl symbolizes wisdom and intelligence, because of its ability to see in the dark, and to allegedly presage events in the future. When Lakṣmī rides upon Ūluka the people are blinded by wealth, they forget the true purpose of wealth and destroy themselves with it. Both Lakṣmī and Śukra (Venus) are the offspring of Bhṛgu and are therefore siblings. Śukra is the preceptor of the Daityas who the elder brothers of the gods and are in fact the “anti-gods” — their philosophy is rank materialism. Similarly the Divine Mother Lakṣmī is thus co-opted by materialists to achieve their selfish goals. 1. Ādi-Lakṣmī —“Primeval Lakṣmī” or Mahā Lakṣmī, lit “The Great Lakṣmī”: an ancient form of Lakshmi and incarnation of Lakṣmī as daughter of sage Bhrigu. Four-armed, carries a lotus and a white flag, other two arms in Abhayā mudra and Varadā mudra. 2. Dhana-Lakṣmī —“Wealth Lakṣmī” presiding over all forms of resources, wealth and prosperity. Six-armed, garbed in red garments, carries cakra(discus), śaṅkha(conch), Amrita kumbha(a pitcher containing Amrita –nectar of immortality), bow-arrow, a lotus and showing Abhayā mudra with gold coins falling from it. 3. Dhairya-Lakṣmī —“Grain Lakṣmī” presiding over all forms of agricultural activities and produce. Eight-armed, garbed in green garments, carries two lotuses, gadā(mace), paddy crop, sugarcane, bananas, other two hands in Abhayā mudra and Varadā mudra. Giver of animal wealth like cattle and elephants also giver of power of royalty. According to Hindu mythology, Gaja Lakshmi restored the wealth and power lost by Indra(king of gods) when she rose from the churning of the ocean. Four-armed, in red garments, carries two lotuses, other two arms in abhaya and varada mudras, flanked by two elephants bathing her with water pots. 5. Santāna Lakṣmī —“Progeny Lakṣmī”: Bestower of offspring. Six-armed, carries two kalashas (water pitcher with mango leaves and a coconut on it), sword, shield, a child on her lap, a hand in Abhayā mudra and the other holding the child. The child holds a lotus. 6. Vīra-Lakṣmī —“Valorous Lakṣmī ” or Dhairya-Lakṣmī, “Courage Lakṣmī”: Bestower of valour in battles and courage and strength for overcoming difficulties in life. Eight-armed, garbed in red garments, carries cakra, śaṅkha, bow, arrow, triśūla(or sword), gold bar or book, other two hands in Abhayā and Varadā mudras. 7. Vijaya-Lakṣmī —“Victorious Lakṣmī” or Jaya-Lakṣmī: Giver of victory, not only in battles but also over conquering hurdles in the pursuit of success. Eight-armed, garbed in red garments, carries cakra, śaṅkha, sword, shield, lotus, pāśa, other two hands in Abhayā and Varadā mudras. 8. Vidyā-Lakṣmī —“Knowledge Lakṣmī” presiding over the knowledge of arts and sciences. Four-armed, garbed in white holding 2 lotuses and showing the Varadā and Abhayā mudras. Saubhāgya-Lakṣmī — “Giver of good Fortune”: Giver of prosperity in general. Rājya-Lakṣmī — “Royal Lakshmi”: "She who blesses rulers (with secular power)"
Vara-Lakṣmī — “Generous Lakshmi”: "The lady who bestows Beautiful Boons". it started around the 1970s, a leading Sri Vaishnava theologian, Śrī U. Ve. Vidvan Mukkur Śrinivasavaradacariyar Svamikal, published a poem called Aṣṭa Lakshmi Stotram dedicated to the eight Lakṣmīs. Although these attributes of wealth bestowed by the Aṣṭa Lakṣmī or Śrī can be found in traditional literature, the emergence of these eight Aṣṭa Lakṣmī goddesses in precisely this combination is still considered new as far it can be traced. Since then, however, this form of Śrī has gained a significant popularity among devotees, there are now several temples dedicated to Aṣṭa-Lakṣmī in India and USA. Bhū-devī is the personification of the Earth and the symbol of Patience and Tolerance. Lakṣmī is the embodiment of Compassion and Bhu-devī is the embodiment of Forbearance. These are the two energy forces which are required in order to pursue function of preservation of the universal order (Ṛita), and for the liberation of all beings. Thus Lord Viṣṇu as the “Preserver” is associated on a material level with the Earth and it’s resources and on the ethical level by compassion and forbearance. In her iconography Bhūdevī is depicted seated under a tree displaying the gesture of fearlessness and holding a globe representing the planet earth. The left foot rests upon a “nidhi- kumbha’ — a pot filled with the treasures and resources of the earth. In most Śrī Vaiṣṇava temples Lord Nārāyaṇa is usually accompanied by 2 consorts — Śrī-devī to His right and Bhū-devī to his left. A third consort is mentioned but seldom actually depicted – this is Nīlā devī. She is said to stand behind the Lord — she is his ahlāda-śakti — energy of Bliss. All three Goddesses are manifestations of Lakshmi. Nīlā Devī further incarnated on earth during the Krishna Avatāra to become his wife in Gokula. Rādhā — the most popular companion of Krishna in North India is not known in the Southern Vaishnava tradition — her place is occupied by Nīlā-devī. Rādhā was always the paramour of Krishna whereas Nīlā was his spouse. The lord is said to have 8 consorts all together: they represent the eight channels through which the various preserving energies or faculties of the Lord can display their beneficial activities. Some texts differ from each other in the names of the Goddesses. Śrīman Nārāyaṇa manifests in 24 different forms, in each of these forms he is accompanied by Lakṣmī. Vāmana - Saviour of Indra, he who produces joy in others. Śrīdhara - The bearer of Śrī who listens-to-prayers. Hṛṣīkeśa - Master of the senses. Sankarṣaṇa - He who draws others near him. Janārdana - The protector from negative forces. Hari - The one who accepts oblations, or the remover of sin. Achyuta - He who never falls from his status. Kṛṣṇa - He who is exceedingly delighted with his own Lila. These celestial beings are differentiated from other jīvas by the fact that they have never been contaminated by material nature and are the eternal coadjutors of the Lord. But from the view point of attributive consciousness they are the same as all other jīvas. They comprise the retinue of the Lord (pariṣada devatā). The duties that they actually discharge are so mysterious that no attempt has ever been made at defining them. They also have one more trait that other jīvas do not have and that is the ability to incarnate at will. The chief among the Nitya Suris is Ananta who is the principle servant of the Lord; acting as His couch, Umbrella etc. Also prominent are Garuda who is the vehicle of the Lord and Viśvaksena who as the "Lord of Hosts" is the chief minister to the Lord in all affairs Heavenly and mundane. (a) the eight gatekeepers (Dvāra pālakas) who are said to embody the eight siddhis or yogic powers: Caṇḍa, Pracaṇḍa, Bhadra, Subhadra, Jaya, Vijaya, Dhātṛi and Vidhātri. (b) The eight maid servants of the Lord who stand around Him with fly whisks known as Cāmaras: Vimalā, Utkarsi, jñāna, Kriya, Yoga, Prabhvi, Satya, and Īśāṇa. (c) The eight Guardians of Vaikuṇṭha Town who are also the generals in the army of the Lord: Kumuda, Kumudākṣa, Puṇḍarīka, Vāmana, Saṅkhu-karṇa, Sarva-netra, Sumukha, and Su-pratiṣṭhā. The Āḻvārs or often transliterated as Azhwars (Tamil: ‘those immersed in the Divine) were Tamil poet saints of south India who lived between sixth and ninth centuries and espoused ‘devotion’ to Viṣṇu-Krishna in their songs of love, ecstasy and service. These twelve Vaishnava saints who lived during the early medieval period of Tamil History helped revive devotional Hinduism (bhakti) through their hymns to Vishnu and his incarnations. The collection of their hymns is known as Divya Prabandham which is part of the daily liturgy in all Śrī Vaishnava temples. The Bhakti literature these Āḻvār's compiled has contributed to the establishment and sustenance of a culture that broke away from the ritual-oriented Vedic religion and rooted itself in devotion as the only path for salvation. In addition they helped to make the Tamil religious life independent of Sanskrit. They are regarded as the “Rishis” of the South and the Divya Prabandham that they composed is considered on a par with the Sanskrit Vedas. They are referred to as the Drāviḍa Veda. The one held in greatest esteem among the Āḻvār s is Nammāḷvār. He lived during the seventh century CE. He contributed a total of 1352 hymns to the four thousand prabandhams. His hymns are considered by the Śrī Vaishnavas to contain the essence of the Vedas. His work Periya Tirumoḷi (Divine words) is the one of the key works of Vaishnavism. Periyāḻvār delighted in worshipping Vishnu as mother, nurse, devotee and lady love. Andal, who grew up in Periyāḻvār 's home as his adopted daughter and is the only female Āḻvār, composed many poems of love to Krishna, the most popular being the Tiruppaavai, a most beautiful collection of 30 verses giving expression to the purest love of God. Nammāḷvār, or Caṭakōpaṉ, belonged to the Vellala (Śūdra) caste. Tirumangai Āḻvār belonged to the Kallara tribe, Tirumalisai Āḻvār belonged to Paraiyar “untouchable” caste. Tiruppani Āḻvār belonged to Panār “untouchable” caste, Kulashekhara was a warrior and Vishnu Chitta, or Periyāḻvār was a Brahmin. Interesting enough Nammāḷvār, the Śūdra, is the head (kula-pati) of the Śrī Vaishnava lineage!